So, you're pretty much 100% vegan but you can't ditch the cheese and the ice cream and the milk. You need milk for your oatmeal and you crave ice cream at night and you love a cheese pizza. 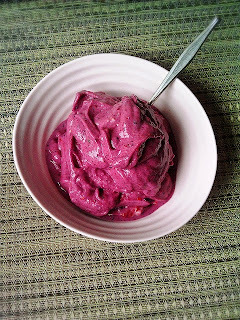 The above picture is nana nice cream, dairy free but completely satisfies a dairy craving. Take it from a former cheese fanatic, you can kick dairy, it may just take some time and some inner motivation. What motivates you to be vegan? For me, it's animal welfare, first and foremost. The health benefits and the environmental benefits are an added bonus. You have to find out what motivates you to eliminate animal products from your diet and you need to believe in it. Be inspired everyday to feel motivated because it will get you through the tough times during a cheese craving. First let me give you the recipe for the picture above. It is super easy, only two ingredients and it takes less than five minutes. Put the bananas, berries and protein powder in your high speed blender and blend until everything is....blended :) You may still have a few berry chunks in your ice cream but it makes it even better. The vanilla gives the nice cream some flavor and lessens the banana flavor slightly; you can also use vanilla extract. The nice cream ends up super thick and creamy, a soft serve texture. This is how you kick the dairy ice cream. Frozen bananas with anything and everything added: peanut butter, protein powder, cacao powder, dairy free chocolate chips, nuts, chocolate syrup, coconut cream etc etc, the vegan ice cream toppings are endless. Try some dairy free milk. There are alot of options out there: soy, almond, rice, oat and more. My favorite is almond milk and I must say, my homemade almond milk tops any store bought almond milk. I usually sweeten my homemade almond milk with dates. When I do buy it, my favorite brand of almond milk is Trader Joe's. Almond milk is thick and creamy and is similar in texture to whole cow's milk. We are not cows so we do not need cow's milk to get our Vitamin D or to keep our bones strong. The billion dollar dairy industry has us thinking we need cow's milk. There is nothing natural about a baby calf being ripped from its mother so we can drink her milk...nothing at all natural about that. 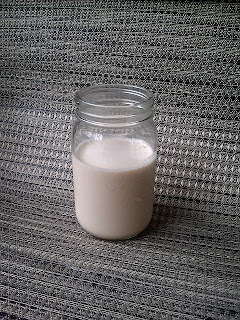 Dairy free milk can be used in your cereal, to dunk your cookies in, you can sip on it at breakfast or use it in your coffee. You will never know how it tastes if you don't try it. Dairy-free creamer is becoming more and more popular and I've tried several brands. I like soy creamer and coconut creamer in my coffee. I love decadent tasting coffee so I'm always looking for delish creamer. Currently, I'm drinking coffee with Califia Farms almond/coconut milk creamer and it's pretty good. I added 1/4 tsp of vanilla extract to my coffee which gives it just a touch of sweetness without adding sugar. Is non-dairy milk processed? Is it even worth it? If you need milk everyday for one reason or another, it's worth it. Plant-based milks are made with the base (soy, almonds, coconut etc), a sweetener, a thickening agent and some preservatives. Do we want to be drinking preservatives etc? Not really but there are companies out there that care about the ingredients that are in their products and they make good milk. Buy the milk with the least ingredients? Does cow's milk have sugar added? Yep. Plus you get the antibiotics and hormones that were given to the cow's. You get cholesterol and saturated fat. Research plant-based milks and you will enjoy the switch, trust me! Cheese....coming from an Italian family, cheese was on everything when I was growing up. We ate alot of pizza, I put cheese on everything, spaghetti, sandwiches, in mac and cheese, I loved it. It was the hardest food for me to give up when I became vegan but my desire to not support the dairy industry was stronger than any extra cheese pizza. And cheese is not even good for you, it raises your bad cholesterol and clogs your arteries. There are many non dairy cheese out there but if you don't want to try them, you can work around cheese altogether. You can make pizza without cheese, you can use nutritional yeast on your pasta, which has a similar taste to parm cheese. A gorgeous veggie sandwich with some olive oil and sea salt and pepper doesn't even need cheese. You may not even need to replace cheese with vegan cheese and that is wonderful. If you're curious about non dairy cheese, my favorite brands are Go Veggie and Trader Joe's. There are more artisan type cheeses out there now like Treeline and Chao and Field Roast. They usually pricey but so is cheese from cows so if it's important to you to have cheese in your fridge, try a few different brands. Dairy can upset your stomach and cause lactose intolerance. It can make you feel bloated and it can raise your cholesterol. Some people feel much better when they eliminate dairy. If you have stomach issues, you can try phasing out dairy and see if you feel better.